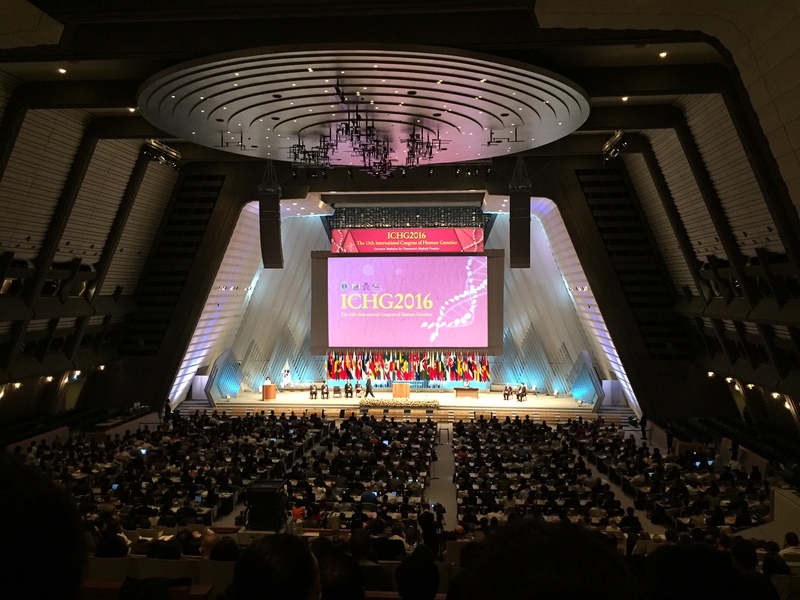 The 13th International Congress of Human Genetics 2016 (ICHG2016) is currently taking place in Kyoto. 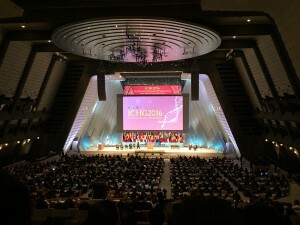 This congress is the oldest and the largest meeting of human geneticists in the world: the first meeting took place in 1956 in Copenhagen and today’s congress is attended by more than 3,000 people from 70 countries. ICHG2016 is really a landmark event: it has Genomic Medicine as the main theme and for the first time it takes place in Asia during one of the most beautiful seasons of blooming sakura. As Helena Kääriäinen put it during the opening ceremony: “Why do we need to collaborate in human genetics? Because as human beings, we are much closer genetically than we are culturally”. 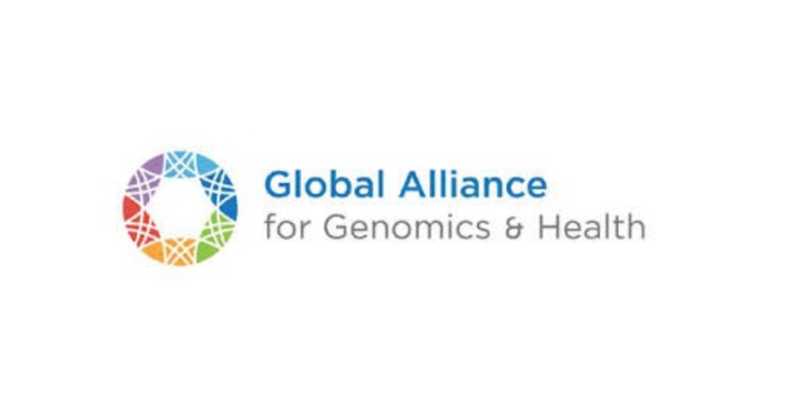 On a day prior to ICHG2016, Global Alliance for Genomics and Health (GA4GH) held its global engagement workshop attended by more than 100 participants. At the beginning, Eric Lander presented the metastatic breast cancer (MBC) project. In October 2015, they launched a website where women with MBC who respond to specific drugs could register and donate their saliva in order to sequence their DNA and hopefully understand what the underlying causes of their response to those drugs are. Since that time, more than 1700 women registered and more than half of them donated their samples for research. This is more data than a similar academic project managed to collect in 3 years, which confirms the power of community efforts. Makoto Suematsu introduced the Initiative on Rare and Undiagnosed Diseases (IRUD), which gave a good overview of how rare diseases are approached in Japan. After this, several outcomes of the work of GA4GH were presented. Firstly, it was announced that the BRCA Challenge – a demonstration project of GA4GH – will release the newest version of the BRCA Exchange web portal on April 3, 2016. The BRCA Challenge is an international effort to advance understanding of breast, ovarian, and other cancers by pooling genomic and clinical data on the genes BRCA1 and BRCA2. The BRCA Exchange, the first product of the BRCA Challenge, is a publicly accessible web portal that provides a simple interface for patients, clinicians, and researchers to access curated expert interpretations and some supporting evidence for genetic variants identified in BRCA1 and BRCA2. 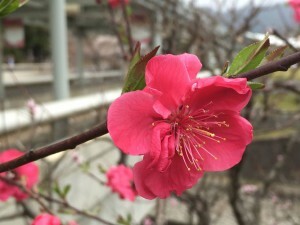 Subsequently, other demonstration projects of GA4GH – Matchmaker Exchange, Beacon project, and Human Phenotype Ontology (HPO) – were presented. Please note that all these projects are open for collaboration and contributions! 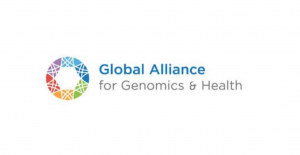 The perspective of patients on genomic data sharing and their involvement in research was outlined by Sharon Terry, the founder of the Genetic Alliance. Sharon’s energising presentation was followed by an introduction to the participants’ values survey by Anna Middleton from the Sanger institute. This survey was designed in order to understand what would motivate people to share their DNA sequence with researchers. As part of the Regulatory Ethics Working Group (REWG) of GA4GH, DNAdigest and Repositive made their contribution to the design of this study. The survey is now available on-line and will be translated into several languages in the near future. You are welcome to take this survey or just enjoy the videos explaining the basics of genomics in very simple terms! The final part of the workshop was dedicated to regional genomic initiatives. Every part of the world now has genomic projects, and each of them can contribute something special to solving the human genome puzzle and its relation to disease. Masayuki Yamamoto presented the Tohoku Megabank Project which started after the earthquake and tsunami in Fukushima in 2011. This project aims to bring genomic medicine to people suffering the consequences of the earthquake and tsunami as soon as possible. The activities involve recruiting and sequencing 150,000 people. Bin Tean Teh gave an introduction into approaches to clinical NGS in Singapore. Charles Rotimi from the Human Heredity and Health in Africa Initiative explained how genetic research works in Africa. As usual, the topic of data sharing was a recurring theme. Surprisingly, very often researchers in Africa don’t have resources for collaborations within Africa but collaborate with external researchers (mainly in the US and UK). They are happy to share their data but they emphasise that this must be a real partnership, not just export of data from Africa. Find more details about the project and governance behind it here. We plan to bring to light the most interesting presentations from ICHG2016, so stay tuned!